– Males: 17 to 19 inches (43-48 cm). – Females: 16 to 18 inches (41-46 cm). – Males: 29 to 35 lbs (13-16 kgs). – Females: 24 to 32 lbs. (11-14 kgs). The Lagotto Romagnolo (also known as the Truffle Dog) is an ancient breed of water retrieving dogs from Italy used in the marshlands to hunt waterfowl. 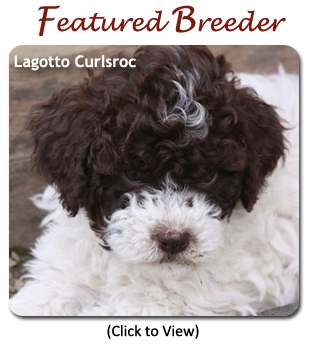 The Lagotto is thought to possibly be the ancestor to all the water dog breeds. When the marshlands dried up, at the end of the 19th century, the Lagotto was used to search and retrieve truffles (much prized and very valuable underground tubers). He is an excellent retriever with an exceptional sense of smell. The Italian Lagotto Romagnolo Club was founded in 1988 with a population of approximately 3500 dogs. The ENCI, the Italian Kennel Club, officially recognized the breed in October 1991 and the FCI followed suit in 1995. In October 1999, the Kennel Club (U.K.) granted recognition to the breed. 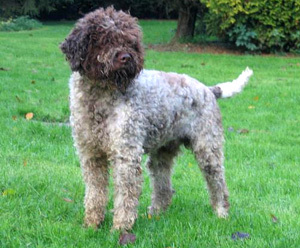 Today, the Lagotto is unique in the fact that he is the only pure bred dog in the world recognized as a specialized truffle searcher. With the breed being imported to countries where truffling does not exist, the question of the breed’s working function was raised. 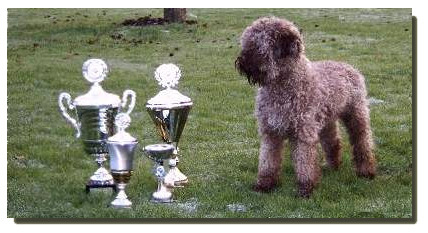 The Romagnolo consider working capabilities of the Lagotto of paramount importance and, with the founding of the World Union of Lagotto in Italy in 1998, the decision was made that the function of the Lagotto Romagnolo in countries where there is no truffling would be to remain as he was originally bred — a Water Retriever. He is an affectionate, undemanding and devoted dog. Easily trained and always eager to please, he makes an excellent companion and good watchdog. 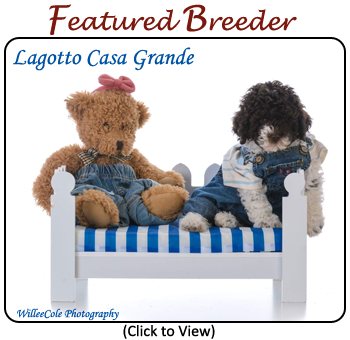 The Lagotto gets along well with other dogs and pets and he is also known to be very good with children. He has a wooly textured, rough-surfaced coat of thick, ring-shaped curls evenly distributed all over his body except his head where the curls are less tight and form eyebrows, whiskers and a beard. Both the outer and under coats are waterproof. He may be either solid off-white, white with brown or orange markings, brown roan, solid brown, or solid orange.